The most important issue in today’s political debate seems to be the central question who will contest with whom at the forthcoming general election. The main reason for this is the re-emergence of Mahinda Rajapaksa as a formidable candidate despite his defeat in the last presidential election – a rather unlikely phenomenon in the rest of the democratic world. The net result is that already there are two factions of the SLFP and a major part of the previous administration’s unusually large cabinet is with the Rajapaksa group, while the rest are with the current President Maithripala Sirisena. A call has been made by many of them to nominate Rajapaksa as the prime ministerial candidate of the SLFP. All indications from the Maithri faction have been to suggest that they are not amenable to the idea. President Maithripala has gone on record saying that his party would not nominate a prime ministerial candidate and the prime minister will be chosen by the members who will be elected to the parliament. This in effect is an indication that he is not ready to accommodate the former president as his party’s prime ministerial candidate. Maithripala Sirisena as the current leader of the party according to the party’s constitution enjoys vital powers with regard to determining the nominations at elections. Technically he has the ability to manipulate within the party in all important matters of party administration. Unlike the UNP constitution the SLFP constitution does not make one the leader of the party by virtue of his being the incumbent president of the country. Nevertheless occupying the presidential seat gives Maithri a lot of leverage when running his political party as its leader. Despite attempts by various parties to put the two factions together, the question remains as to what extent they can work together. 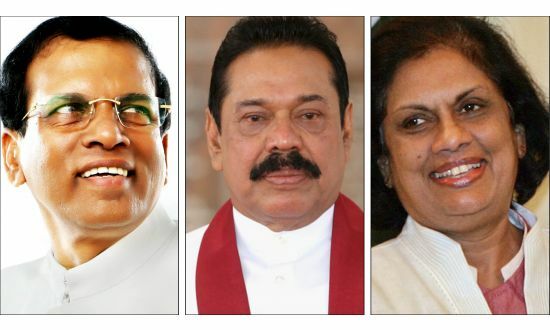 Having worked together to topple the government of Mahinda Rajapaksa, still there seems to be much cordiality and understanding among Ranil Wickremesinghe, Maithripala Sirisena and Chandrika Kumaratunga while no such good relations seem to prevail between any of them and Mahinda Rajapaksa. In such a scenario, despite whatever political pressure, there is much doubt as to whether Rajapaksa would be recognized as the prime ministerial candidate of the SLFP. On the other hand Rajapaksa and his supporters have quite strongly laid claim to the position and are ready to contest even under a different banner in the event the SLFP refuses to give them the opportunity. Mahinda Rajapksa has already announced that his group will be contesting the forthcoming general election as the people’s request cannot be ignored. However he has been careful enough not say under what party or symbol he would be contesting leaving room for him to negotiate with the incumbent president. However it is not a secret that there has been much animosity between Mahinda and Maithri ever since the latter came forward to contest as the common candidate of the then opposition. Maithri’s decision to do so was greatly influenced by the way he was treated by the Rajapaksas when he was a minister. One of the main grievances was the denial of the premiership to him despite seniority. Then there is the long standing feud between Mahinda and Chandrika. The influence she has over Maithripala and the party matters in general will also stand in the way of any amicable settlement. Finally there are the likes of the JVP, Venerable Maduluwawe Sobitha thero and his National Movement for a Just Society and others who backed the candidature of Maithripala at the last presidential election including Sarath Fonseka who will not be happy with the idea of Rajapaksa becoming powerful again. These factors would make any amity between the two warring factions of the SLFP a remote possibility unless there is change of heart at the last minute in the greater interest of the party. In this regard one cannot forget Maithripala’s recent statement that the country is more important than the party which is an indication that he is not ready to work with Rajapaksa in order to save the party. With the people being still confused, nominations being still on and election campaign yet to begin, one may not be able to guess the outcome of the forthcoming election. Meantime the UNP seems to have recovered from most of its ailments and is getting ready to cash in from the situation. With the current developments one finds it difficult to expect unity in the SLPF and it is the UNP that is most likely to benefit from such a split.